Please send me a price for the NPP-4824-6F-Dis27lbs new 48x24 plastic pallet. This 48x24 half pallet displays product in stores or can be used for small order shipments from distribution centers. The NPP-4824-6F-Dis27lbs plastic pallet has just 6 feet. The small base saves floor space and easily moves through doorways. This stackable plastic pallet has a strong 6 feet bottom deck for safe double stacking of multiple plastic pallets with product. 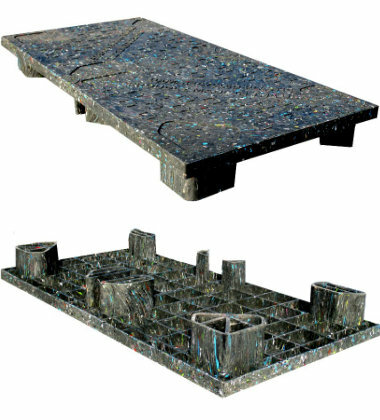 Plastic pallets like the NPP-4824-6F-Dis27lbs are lightweight and durable. Its uniform length and width provide ease of use and safety. Get more turns using the NPP-4824-6F-Dis27lbs multi-trip plastic pallet and easily win back startup costs with durable and reliable plastic. Use the NPP-4824-6F-Dis27lbs captive plastic pallet in closed loops to satisfy in-house reusability requirements with the reliability of plastic. Save costs when shipping cargo via air with the NPP-4824-6F-Dis27lbs air freight plastic pallet. Perfect for single use and one-way air shipment. This mid duty pallet is rated for 1,800 lbs of dynamic load or the maximum weight the pallet holds when moved by jack or lift. Is the NPP-4824-6F-Dis27lbs the right pallet for you?